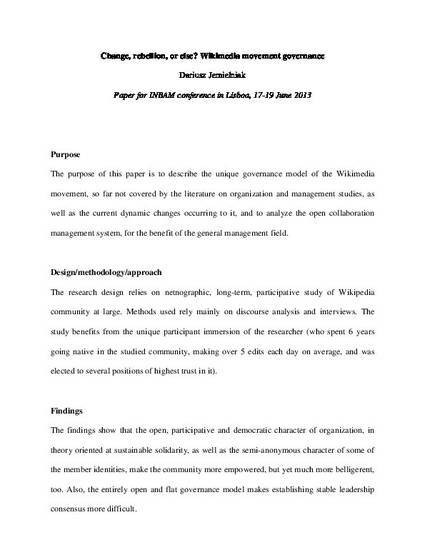 Purpose: The purpose of this paper is to describe the unique governance model of the Wikimedia movement, so far not covered by the literature on organization and management studies, as well as the current dynamic changes occurring to it, and to analyze the open collaboration management system, for the benefit of the general management field. Design/methodology/approach: The research design relies on netnographic, long-term, participative study of Wikipedia community at large. Methods used rely mainly on discourse analysis and interviews. The study benefits from the unique participant immersion of the researcher (who spent 6 years going native in the studied community, making over 5 edits each day on average, and was elected to several positions of highest trust in it). Findings: The findings show that the open, participative and democratic character of organization, in theory oriented at sustainable solidarity, as well as the semi-anonymous character of some of the member identities, make the community more empowered, but yet much more belligerent, too. Also, the entirely open and flat governance model makes establishing stable leadership consensus more difficult. Originality/value: The paper extends our understanding of organizational dynamics and governance in open collaboration organizations, and exposes the shortcomings of this model, which are an inevitable tradeoff of its undisputable pros.